With nearby Sly Park, these trails offer extended challenges for hiking, biking, or horseback riding. The area is popular for mountain biking, but good walking and exploring are also options. There aren’t a lot of easy trails here for beginners, but they will appreciate the lack of motorized traffic while learning to become intermediate riders. This area is managed by the USFS Placerville office, and is closed to all motorized use. With an elevation of near 4000 feet at the trailhead, this area is sometimes closed by low snow in winter. Directions: Follow directions to Sly Park but turn onto Mormon Emigrant Road and go about 2 miles to Blue Gouge Mine Road, turn R, and go a short ways to the obvious parking area. One trail can be accessed from Jenkinson Lake Dam on its east side where you can find FS 10N50K road (gated) going south from the road near the horse trail coming from Black Oak staging area. The trails span a two square mile area of old logging roads and a railroad grade that circumnavigates the big Fleming Meadow. Steeper routes drop into the Camp Creek Canyon which borders this area along its south side. 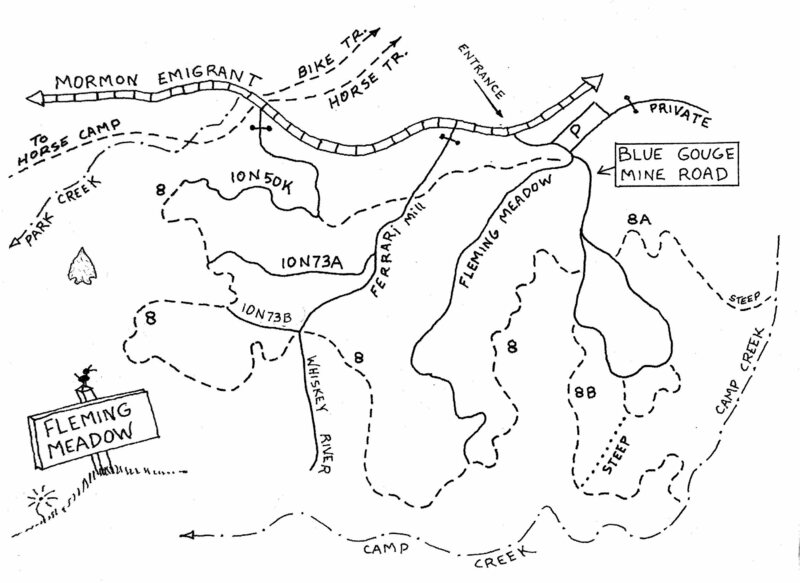 Route “8” is the main and easier trail, with 8A and 8B being steeper options. The steepest trails (not shown on map) follow the powerline that crosses through the area. History: Named for the Fleming family who settled as pioneers in this area. Samuel Fleming was a lumberman and toll keeper who collected tolls for an old road that used to connect Cedar Park to the Pollock Pines area (along present Sly Park Road). The Flemings had a house at the southern end of Fleming Meadow.